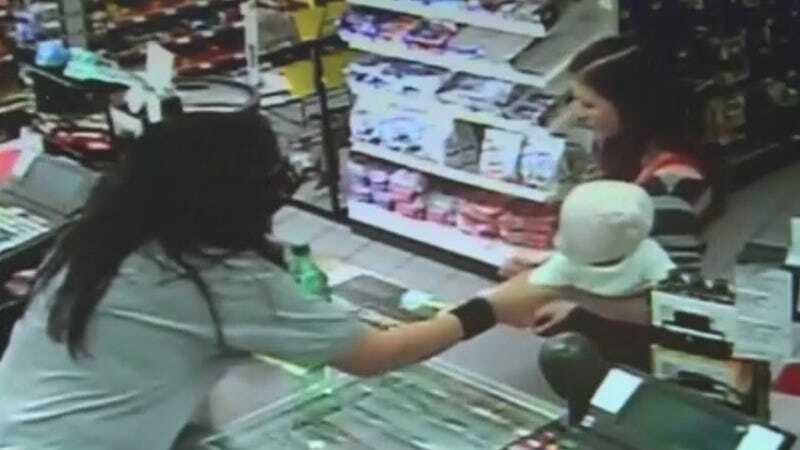 Before you watch, you should know that Colorado convenience store clerk Rebecca Montano did save the baby. The baby is okay. It’s still a very awkward and scary video. I was talking to the baby and she — the girl — had a glazed look on her face... I wasn’t sure, I felt uneasy about it. I was asking her ‘is everything ok,’ I grabbed the baby’s arm and she started to sway, she wouldn’t answer me. I’m a mother, I’m a grandmother. It’s motherly instinct to worry about children... I just wanted to save the baby from getting hurt, if she would’ve fallen with the baby in her arms, who knows where that baby would’ve landed? The footage shows a harrowing moment that I will admit to involuntarily laughing at, specifically the moment when she was struggling to hold the baby and the mother’s arm at the same time. But it was an anxiety laugh, I swear to God. Also laughed when that guy took so much time putting down all his purchases, like he thought she’d ring them up before he ran out of the store in a panic. Our hero, Montano, ended up calling the police herself and the mother is reportedly doing fine. No word on that guy’s Vitamin Water.